My name is Karl (I am also known as Doug) and I live in Florida, U.S.A. I was born in the Caribbean Island of Jamaica. I have always been 'tinkering' with anything electronic from I was growing up. My early years were spent buying miscellaneous electronic parts and making various items..... I was always building something! The limited availability of miscellaneous electronic parts in Jamaica made me extremely resourceful in finding ways of using available items to make what I needed. I asked relatives who visited or lived in the United States or England to purchase electronic parts for me or I would try to 'manufacture' parts from whatever I found that I thought could be modified. I was very successful in my modifications and I was continuously being congratulated by my relatives and friends. I also tried to purchase every electronic book/magazine that I could afford. I was totally obsessed with purchasing these books/magazines! My first real electronic project was building an alarm system for my house. It worked very well and I ended up building others for my family and friends. The greatest of all projects was the designing and building of my automatic gate. My friend and I built the gate from steel bars and plates. With the help of another friend, I built the track for the gate. The motor for moving the gate was fashioned from an overhead garage door opener. This motor drove the chain that moved the gate. This was a huge success. I became involved with computers several years ago when the main operating system was DOS (Disk Operating System). When Windows became the operating system of choice, my interest in computers became more intense. I took discarded computers, dismantled them and checked the parts in detail to see how these parts made the computer work. Eventually, I bought my first computer - A Gateway 2000 486-DX2 66MHz desktop. Believe it or not, this was a top-of-the-line model at the time ..... boasting a 66MHz processor, 8MB of RAM and a 540MB hard drive! I thought that this was the ultimate! I was on top of the world! My first upgrade was adding an 8MB stick of RAM. During this time, people were more interested in using the personal computer for word processing and spreadsheets ... not the Internet. After a few weeks, I heard my friends talking about the Internet and e-mails so I asked one of them (who was visiting the United States) to purchase a 33.6KB modem for me. As soon as he got back to Jamaica and brought me the modem, I quickly got to work and installed it and I immediately applied to the only available Internet Provider at the time (Cable & Wireless) for Internet service and anxiously waited for activation. The long awaited dream of "surfing the Web" then became a reality! What a day that was for my wife (Joan) and I! We surfed and surfed the Internet forgetting that we had a limited (not unlimited!) service and we certainly paid the price! .... with a very heavy Internet bill! But, we enjoyed it so much that we did not mind paying. As time went by, I became actively involved in building and repairing computers. Computers are no longer thought of as 'luxury' items.... It is extremely important to own a computer! Computers can be used to do most of our day-to-day activities. In addition to using a computer for word processing and spreadsheets, it can be used for playing games, listening to your favourite CDs, looking at your favourite DVDs, doing research on the Internet, on-line banking and bill paying. It is now found in a number of homes and has become an important 'household item'. My mission was (and still is!) 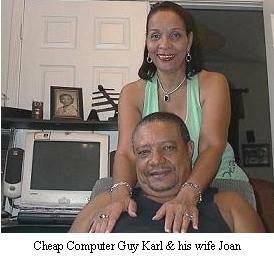 to assist as many people as possible in owning their own computers either through building their own or purchasing. My goal is to teach people to build cheap computers using cheap computer parts. When my wife and I migrated to the United States of America, I continued to build and repair computers. Computer parts were easier to acquire and this made my work much easier. I asked myself: "What would be the best way to impart my knowledge to as many people as possible"? An idea then 'hit' me... Why not build a Website presenting a build your own cheap computer tutorial? I was already sourcing and purchasing high quality cheap computer parts from a number of Vendors. How did I build this Website? Although you came to this Website to learn to build or buy cheap computer systems, I hope that you will not mind me adding this section about My Dream Come Through. You might even be wondering how I built this site? My passion for building or buying cheap computers gave me the encouragement to make the decision to impart my knowledge to as many people as possible and .... what better way would that be than via the Internet?! Maintaining this site has been zero cost to me since it is paid for by the profits that I earn from affiliate programs including Google Adsense and other very popular online stores..... No kidding! This site was built with a product called Solo Build It! (SBI!). Solo Build It! caters to everyone - from beginners to the most experienced site builder. It is made by a company named SiteSell which provides all the tools that you will ever need to build a successful site. Do you have a hobby? Using Solo Build It! you will learn how to turn your hobby into earning a profit. It provides an action guide, design templates, search engine optimization, etc. Using Solo Build It! to build my site, made A Dream Come Through! There is nothing like Solo Build It!